Seven Days Blogs: Omnivore: "Top Chef of the Champlain Valley," revealed! "Top Chef of the Champlain Valley," revealed! It sounds like a nightmare: You're seated at a raised table in front of an audience a couple hundred people strong, and they're all watching you eat. And then, as you raise a forkful of risotto to your mouth, a big glob falls off your fork. But it wasn't a dream. It happened yesterday evening during my stint as a volunteer judge for the Champlain Valley Agency on Aging's "Top Chef of the Champlain Valley" competition. My fellow judges -- Jozef Harrewyn of Chef's Corner, Eating Well's Carolyn Malcoun and food-sourcing expert Annie Harlow -- and I were tasked with tasting a series of dishes prepared by high-profile local chefs, and deciding whose cuisine would reign supreme. The MC, as it usually is at such events, was the ebullient Sean Buchanan, executive chef of Solstice at the Stowe Mountain Lodge. The three contestants are all well-known and accomplished: David Hoene of Pauline's Café, Connie Jacobs-Warden of Chow! Bella, and Sam Palmisano of Pulcinella's. The secret ingredients they had to incorporate: oyster mushrooms and celeriac. They also got to "shop" from a beautiful bounty of local ingredients, such as Misty Knoll chicken, baby eggplant, heirloom tomatoes and artisan cheeses. After the scores had been tallied and the judges conferred, we announced Sam Palmisano as the winner. Why? First of all, he did the best job of integrating the required ingredients into his dishes. 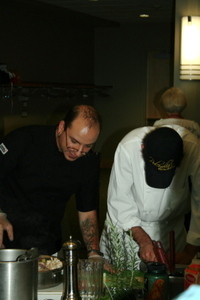 Each participant had to make an appetizer and an entrée. Sam's app was a celeriac and oyster 'shroom bisque, which was thick, creamy and delicious, and, as a bonus, was topped with the mushroom and strips of julienned and fried celeriac. For his entrée, he stuffed a chicken breast with oyster mushrooms and served it over chipotle-Gouda polenta and chard, in a puddle of mushroom jus. Secondly, everything he and his team made tasted great. The polenta was creamy and savory, the chicken was nicely browned on the outside, but not overcooked, and each item was properly seasoned. (One of my Vermont dining pet peeves is the lack of proper salting in restaurants). Thirdly, he resisted the temptation to make things complicated. With so many delightful ingredients available, it would have been easy to pile bunches of them onto each plate, but that can easily lead to a muddle of flavors. It seemed that he decided what would best highlight his skills and the secret ingredients without getting distracted by the cornucopia of colorful fruits and veggies. I also attended the Top Chef competition, and thought wonders of it. The set up could've been a bit better, I wish instead of simply announcing the winner, critiques were given to everyone and then the winner announced. Seems like David and Connie didn't really get a fair shake at knowing what would've been a more pleasant eating experience. Also the food available to the audience was definitely not substantial enough, or plentiful enough. The announcement suggested we would've been able to taste some of the chef's creations....there were some sculkingly scoffing the judge's leftovers...but something tantilizing would've been nice ! Hi Luciana. We actually thought we'd get a chance to talk about the other competitors, but the M.C. kind of starting wrapping things up before we got there. When we arrived, none of us had a really good sense of how the evening was going to play out, and I think we were kind of feeling that as we deliberated and came back to make the announcement. Overall, I think the main downfall was when the chefs tried to use too many ingredients (because the available produce and cheeses were all so delicious), and creating plates that didn't really hang together thematically. I agree that there should have been more food available to attendees, particularly because the event took place during dinner, when I'm sure that everybody was quite hungry. And did you try the mango salsa? It was much hotter than I thought was appropriate for the audience. Maybe they should have a fourth chef turning the ingredients that weren't chosen into snacks for the audience. There were plenty of donated items left over.